Winter temperatures in Alliance, Nebraska can drop to -20°F, but retired mailman Russ Finch grows oranges in his backyard greenhouse without paying for heat. Instead, he draws on the earth’s stable temperature (around 52 degrees in his region) to grow warm weather produce- citrus, figs, pomegranates – in the snow. Finch first discovered geothermal heating in 1979 when he and his wife built it into their 4400-square-foot dream home to cut energy costs. Eighteen years later they decided to add a 16’x80′ greenhouse in the backyard. The greenhouse resembles a pit greenhouse (walipini) in that the floor is dug down 4 feet below the surface and the roof is slanted to catch the southern sun. Finch sells a “Citrus in the Snow” report detailing his work with his “geo-air” greenhouses and says anyone can build a market-producing greenhouse for about $25,000 or “less than the cost of a heat system on a traditional greenhouse”. Another fantastic video by Kirsten Dirksen. Please subscribe to her channel. Whether you want to heat a giant greenhouse in sub-zero temperatures, or cool a home in 115° desert heat, this simple technology can do it very efficiently with only a circulation blower. This is not a “concept”, it’s a proven reality with more than 30 years of real life testing and fine tuning. Anyone could easily build a “free energy” greenhouse anywhere and earn more than $100,000 per acre annually. im very interested in the possibility of doing this. I have been an organic (not certified) vegetable and flower grower for many years. I’m 70 years young, but still growing and looking for economical ways to produce more locally at 46 degree latitude, zone 3, NW Minnesota. Would your plans work this much further north where it’s even colder? He has detailed plans and ebook that explain every aspect of growing food this way. It’s been tested and refined for decades. This sounds like the best approach for you. His book is on sale now for only $12. It’s been extensively updated and expanded. Sounds like a real bargain to me. Here’s a very brief summary why great ideas such as this greenhouse often do not spread far and wide (gain mass acceptance). First of all I want to say the basic technology of underground walipini greenhouses and passive solar building in general has been around a long time and is well proven. Socrates wrote about it thousands of years ago. – lack of financial incentive: Everybody needs to make a living, and money ‘makes the world go round’ as they say. The profit potential on this greenhouse is very low for architects, engineers and builders. The main profit would come from a few days work for the excavator, a few days for the builder, and selling some lexan sheeting and plastic tubing. In comparison, a builder or designer could get a sales comission on a $20,000 heat pump. – resistance to change: People are notoriously slow to change and try new, unfamiliar things. Only a handful of these greenhouses have been built from what I can gather. Much more common low tech ideas such as strawbale, earthbag building, etc. 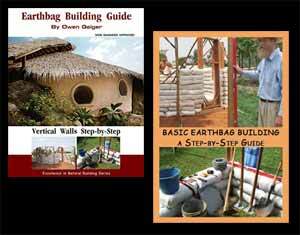 with thousands of buildings now completed, strawbale building in the builing code, lots of books and videos, etc. and still the growth is very slow. – need to compete against similar products: Most people would buy a poly tunnel greenhouse that can be built in a few days without all the excavation and complicated design work. Yes, the greenhouse will need ongoing heating and cooling but growers view these as standard business expenses that are factored into their business plan. – most people are not willing to do the work themselves: This greenhouse is best suited for do-it-yourselfers on a limited budget and who want to protect the environment. It takes commitment to grow a garden year after year. Most people take the quick, easy way. They figure why water trees year after year when you can just buy fruit from the supermarket. Home gardeners on the other hand know the food they grow tastes WAY better than store bought, and is fresher and more nutritious. Look at the owner – he’s 95 and still quite healthy. Eating homegrown produce for decades probably contributed to his good health. His school mates who ate primarily supermarket food are probably long gone. Thank you for taking the time to explain more about it to us. There are going to be running expenses associated with it anyway. On his first greenhouse attached to his home, he did mention that the fan consumers 7.3 kilowatts, which in some parts of the world is going to hit his profit line ( which might not be so significant in Nebraska ). He also has to generate than power if the snow knocks out his power lines ? The perspex sheeting might last for decades, but the polythene has a limited life – I had a polytunnel, and the polythene, even when UV-stabilized – began to split after 8 seasons. I found too that the polythene had to be cleaned inside between seasons for algae and fungi which would require tools and cleaning agents to do it. Consideration too has to be given as to eliminating any chance of legionella coming from the pipes or the inside of the closed greenhouse, from condensation or the prolific watering that his assistant was doing. But good luck to him, and to others who set up similar installations. Thanks for sharing this fascinating project with us. So what is the answer?! Is it a scam? It’s been working for decades so no, it’s not a scam. Journalists and professors have visited. He even sells an ebook that explains everything. So something else is going on… (stay tuned). So again, why hasn’t this idea caught on? It obviously works and could help millions of people save billions of dollars. Post your comment below. I believe I know the answer and will post my opinion in tomorrow’s blog if no one figures it out. Hint: No, people are not stupid. (Well okay, some are. Ha ha.) The video hints at the answer. Like you said earlier, I’m not sure this will work in a humid climate for cooling. As the warm humid air meets the inner surface of the cooler pipe, moisture will build up inside the pipe and quickly become a mold problem. If there is a workaround, I’d love to hear about it. You’d have to install a dehumidifier. No big deal unless you live in a very humid area and then it may not be practical. Talk to an expert in your area who builds greenhouses for a living. I’ve known about this greenhouse for a quite a few years. We covered this story almost a decade ago after finding it on YouTube. It was featured in the January 2009 issue of Nebraska Life Magazine. What’s really hard for me to understand is how few people have replicated this design after being public knowledge for so many years. This is SIMPLE technology – just blowing underground air through tubes into the greenhouse or home with a fan. Seems like there would be one of these on every university campus along with classes on how to build them. Where are the videos that show step by step construction? The government studies? For sure, his neighbors for miles around know about this. Why haven’t they replicated his design? To me it seems like the perfect place to be during those long cold Nebraska winters. And while you’re at it, might as well grow all your fresh veggies like salad greens and microgreens.